For at least several weeks, discussions have been underway about McCain’s Constitutional eligibility for the presidency in certain circles. I was fortunate enough to listen to discussion on this topic for over an hour on local North Florida talk radio. Now, apparently the New York Times, who is obviously seeking to put an end to any hopes of a McCain presidency, is about to break a story on McCain’s Constitutional problem. The problem is this: McCain was born August 29, 1936 in the Panama Canal zone to parents who are both American citizens. Naturally, by his birth to two citizens, he is a citizen at birth. However, the qualification for president states that the president must be a “natural born” Citizen, which is where the apparent problem arises. Through documents from the State Department, the Panama Canal zone in 1936 may not be considered soverign U.S. territory to the point of qualifying McCain as a “natural born” citizen. If true, this could lead to a Constitutional debate and suit challenging McCain’s eligibility for the presidency. This suit could likely be brought by any political group, from the Democratic party to MoveOn.org. This Constitutional challenge, if brought sometime in the summer or late fall could tie up the McCain campaign in a battle that could go to the Supreme Court for a decision! Obviously, any battle of this sort would tie up the campaign so much that an effective run for the presidency would be nearly impossible. Click here for part two (updated analysis). What has happened to Bill Clinton lately? If you watch politics much, about a month ago we were seeing daily clips of him campaigning for his wife and angrily attacking Barack Obama. Well, pretty much since Super Tuesday, we haven’t heard much from Slick Willie. Is it possible that Hillary has accomplished something she wasn’t able to in eight years while in the White House? Does she actually have him on a short leash? Well, in terms of his speech and public appearances, it appears that she does. I doubt that leash extends to other areas though…which is a concern if Hillary wins the White House. Are the American people (and Hillary) prepared for a First Man intern scandal? Can Obama win over any Republicans? Racism, sexism, ageism, class warfare, immigration. These are all big and very divisive issues in this country, and a recent New York Times opinion poll shows that the majority of Americans (67%) believe that Barack Obama is the best candidate to unite the country on these issues. But is he? Barack Obama is currently larger than life and is a candidate that is larger than the race issue. He transcends race and has blacks, whites, asians, and latinos hugging and crying for joy at his campaign stops. Oh, and did I mention fainting too? Seriously though, once you get beyond the hype and the feel good music and chanting “Yes we can” and all that other pep-rally type stuff, is there any evidence that shows he can unite Democrats, Republicans, Liberals and Conservatives on issues? I believe that because Obama has risen above the race issue, which is probably the most divisive issue that divides America, and has successfully united various racial groups within behind him that the majority of Americans are willing to make the leap of faith and say that “yes we can” unite the country! The problem is that he CANNOT and WILL NOT do this. Ideologically and historically through his record, Obama is at least as divisive as Hillary Clinton and possibly more so. Obama has a distinct senatorial record of voting strictly along party lines on all major issues. The only issues where he voted in a bipartisan fashion were in the issues of nuclear proliferation and ethics reform. This clearly partisan record earned him the prestigious title of “Most Liberal Senator in 2007” by the National Journal. Obama ranked as the 16th most liberal in 2005 and the 10th most liberal in 2006. Even in the tremendously bipartisan immigration bill in the summer of 2007 that ultimately failed, Obama even then didn’t join with Republicans. But of course, Obama isn’t running on his record. He is largely avoiding it because he and his campaign managers know that the more people know about him, the less likely they are to vote for him. It’s much easier to give people cheap phrases like “Yes we can” and promise things that are totally free, like hope and love. His wife has promised that he is the candidate that can lead us in “fixing our souls”. This type of political speech strikes dangerously close to religious language when referring to a Messiah. Other phrases like “we are the ones we’ve been waiting for” and “we are the change that we seek” are not only dishonest, but horribly disingenuous. The entire campaign is about Obama and how great the Obama campaign is, but it is not about the followers. Obama can win Republican voters if he can successfully convince them that he isn’t what he really is—that he desires to raise everyone’s taxes significantly, that he desires to annually increase federal money to the U.N. (S.2433) by $65 billion a year, and that he wants drivers licenses for illegal aliens. These are just a few of the issues that will damage him that if everyone knew about. It is going to be a very rude awakening for Barack Obama if he wins the White House. He’s going to quickly find out that “Hope” doesn’t do squat for foreign policy, “Yes we can” doesn’t mean a thing in the Oval Office and “Change” isn’t something everybody wants. Unity is not coming to this country at the hands of Barack Obama. 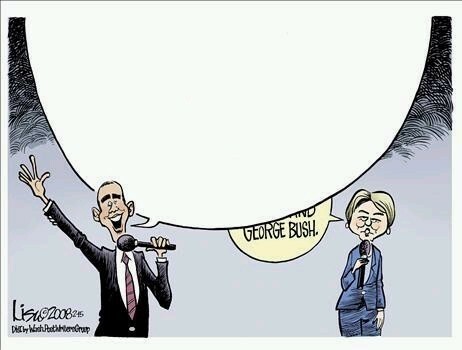 Does Obama’s Record Back His Rhetoric? Just don’t call Barack Obama liberal, okey doke? Is Obama pulling a Vanilla Ice on us? Here’s a funny video created by TMZ reminding us of a controversy 18 years ago. Enjoy! Could Obama’s “Muslim” Photo derail campaign? This morning a photo of Barack Obama surfaced on the campaign trail, apparently released by the Hillary Clinton campaign. It shows Obama dressed as a Somali elder while in Kenya in 2006. There is no doubt that you will begin to see this image appear in emails, just fueling the underground assumption among many that Obama is a closet Muslim. Pretty dirty stuff. At least for those of us on the right, it’s pretty entertaining to watch. On Sunday, Hillary stated that she hoped Ralph Nader’s current run for the presidency was a “passing fancy” and that he was responsible for Al Gore losing the presidency in 2000. One has to honestly wonder if the end of the Bush presidency is going to end the left’s obsession with the 2000 election and the Florida aftermath. The only thing the Florida aftermath taught us is that Democrats like recounts as long as it gives them the result they want, but until they get that result…all the votes haven’t been counted yet. Contrary to popular belief among the left, Ralph Nader did not cause Al Gore to lose the presidency. It was all those darn Bush voters! If Al Gore had successfully convinced voters that he was human instead of an android during the debates, he might have actually gotten a few thousand more votes in Florida and won the election outright. Hillary conveniently forgets about a miniature billionaire named Ross Perot that helped get her husband elected to his first term. It could just as easily be said that Ross Perot was responsible for George Bush Sr losing in 1992 as Nader was for Al Gore losing in 2000. Let’s be honest here…you can only speculate as to what all those Nader voters would do if Nader weren’t in the race. They might have stayed home or they might have participated in a Code Pink rally outside a Marine recruiting office. We really have no idea. The truth is that Ralph Nader got a whopping 0.4% in his last bid for the White House in 2004, so he will likely be a huge NO FACTOR this year. However, the REAL question is whether or not he will be included in the debates. If he is, he should get a significantly larger portion of the vote….say 2%. If he isn’t, he will likely get less than 1%. Hillary’s arrogance is dripping from her statement Sunday morning, “I remember when he did this before. It did not turn out very well for anybody, most especially our country….I hope it’s kind of a passing fancy that people don’t take too seriously.” She might as well have said, “How dare Ralph Nader slow my rise to power! It is only I, the great Hillary that can lead this country.” The Democratic party’s response to Ralph Nader running for President is anything but democratic. He appeals to a distinct type of voter and he should be allowed to run. But let’s remember, third party candidates are only a good thing when they split the Republican vote, right Hillary?